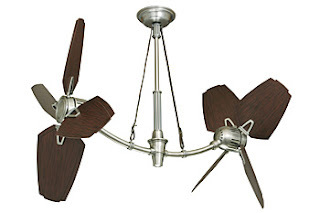 We've just displayed the Big Daddy of all ceiling fans here in Chantilly! It is a show-stopper, for sure. We've noticed that almost every customer that sees it feels the need to touch it ~ almost like they're petting it! I guess it's just so spectacular, they just have to rub it or something! The blades we have on display are B80HCW ~ 22" Hand-Carved Walnut.